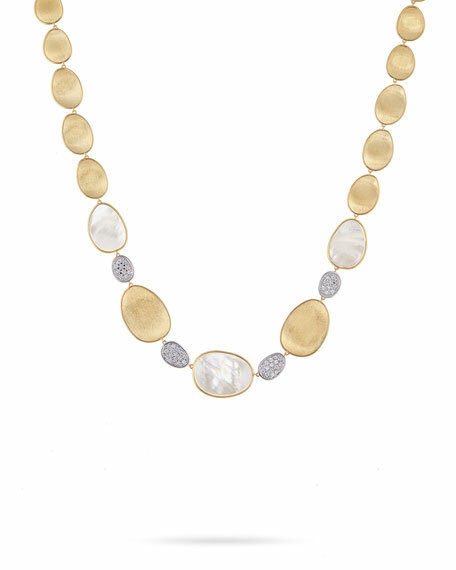 Marco Bicego collar necklace from the Lunaria Collection. 0.96 total diamond carat weight. The Lunaria Collection is a line born from Marco's love of nature. Crafted entirely of hand-engraved, 18-karat yellow gold plates framed by polished gold and hand-molded by expert craftsmen, the collection resembles the gentle movement of petals blowing in the wind. The alternating sequences of plates yield lustrous necklaces, bracelets, earrings, and rings that translate into elegant and refined styles. Devon Leigh three-row pearl necklace. Polished 18-karat yellow gold plating. Naturally white baroque freshwater cultured pearls. Three strands of pearls and mixed-cut aquamarine. Adjustable; 14-karat gold filled lobster clasp. Approx. 18-20"L. Made in USA. Alina semiprecious necklace by Kendra Scott. Your choice of metal and stone stations. 14-karat yellow or white gold chain hardware. Hestia two-strand necklace from Konstantino. Sterling silver with 18-karat yellow gold. Integrated stones and hexagon stations. Black onyx or mother-of-pearl with pearls. 5mm naturally hued freshwater cultured pearls. Lobster clasp. Handcrafted in Greece.